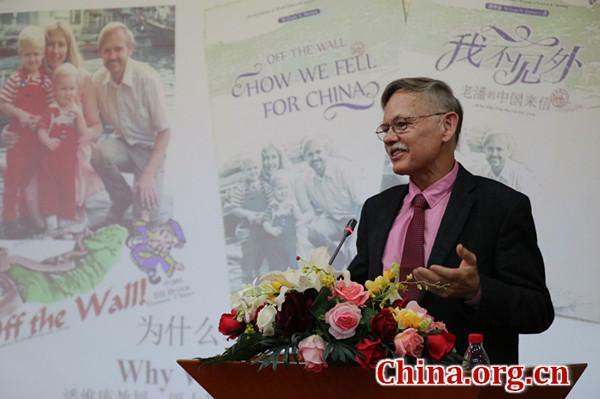 A launch ceremony for an American professor's book of letters home from China was held on Saturday at Xiamen University, located in Fujian province in the South of China. 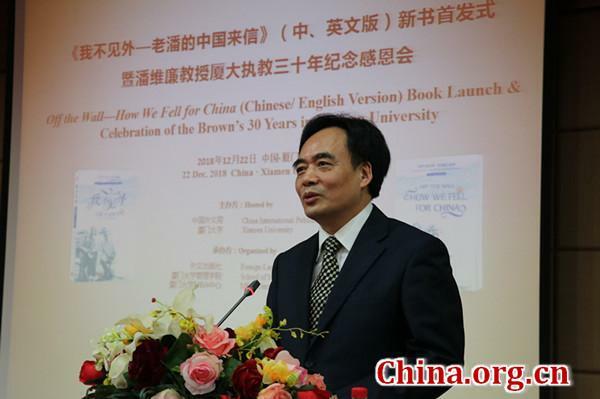 Dr. William N. Brown, a business professor of Xiamen University, moved to Fujian province from the U.S. with his wife and sons in 1988, a decade after the implementation of China's reform and opening-up policy. His new book "Off the Wall – How We Fell for China," is compiled of roughly 50 letters detailing his life in Xiamen, which he sent back home to his family and friends in the United States. The book will be released in both English and Chinese. Having worked at Xiamen University for 30 years, Dr. Brown is often locally referred to as the city's most famous foreigner. In 1992, he became Fujian province's first foreigner to receive permanent residency. An honorary citizen of the province, he has helped 13 Chinese cities, including Xiamen and neighboring Quanzhou, win gold in the International Livable Communities Competition. His book, published by Foreign Languages Press affiliated to China International Publishing Group (CIPG), contains many amusing and touching stories that have happened throughout his time in China. Highlights include, the Browns' first Spring Festival, an 80-day-long driving tour across China, and their 20th wedding anniversary celebrations. One particularly humorous letter details Dr. Brown's difficulties in managing to buy a turkey for thanksgiving in 1989, despite no turkeys being sold in Xiamen back then. The letters had a profound impact on his family back in the United States, who were initially skeptical of Brown's relocation. "These precious letters home helped the Brown's family in the U.S. see an open and developing China, so they changed their impression on the country, and finally supported his move to China," said Lu Cairong, vice president of CIPG. "This book is of high historical value. Because the letters detail, from a foreign perspective, how China has developed during the course of reform and opening up, while portraying a real and vivid China with a humorous tone," Lu added. Since moving to China, Dr. Brown has written over 10 books attempting to introduce Chinese cities, culture and history to English speakers. He said Chinese and American people are mostly the same in so much as they both want peace, security and to take care of their families. "Chinese people have always emphasized peaceful coexistence and prosperity. It's not just a political slogan, it is China's culture and history," he concluded. A launch ceremony for an American professor's book of letters home from China was held on Saturday at Xiamen University.